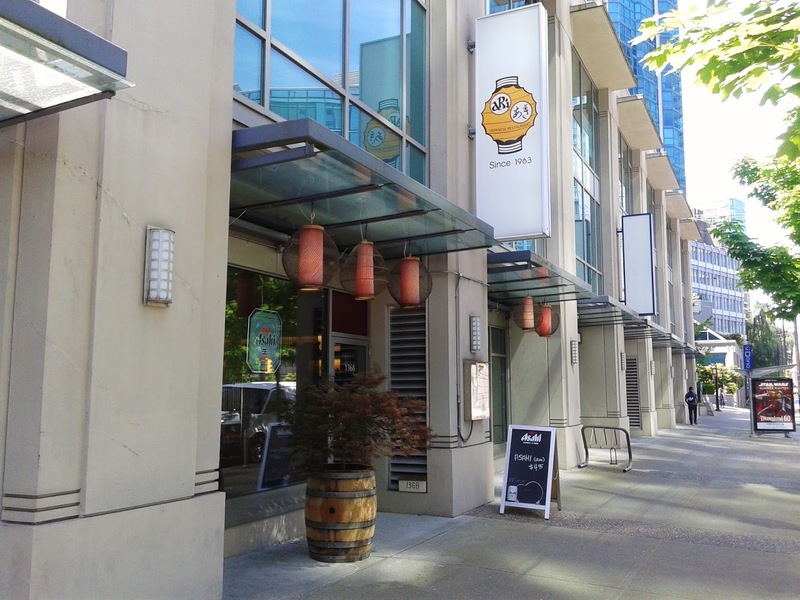 As much as I enjoy travelling around Vancouver, getting to my restaurant destinations can occasionally be a challenge. This time, not only was my sleep interrupted by virtue of the bus breaking down, but I was pestered by so many strangers for spare change that I might as well have written the words "Human Charity" with a Sharpie on my forehead. 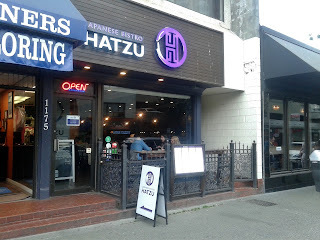 By the time I finally got to Japanese Bistro Hatzu, all of my hunger alarms were ringing at full blast, and I was so low on energy that I barely managed to stay awake. 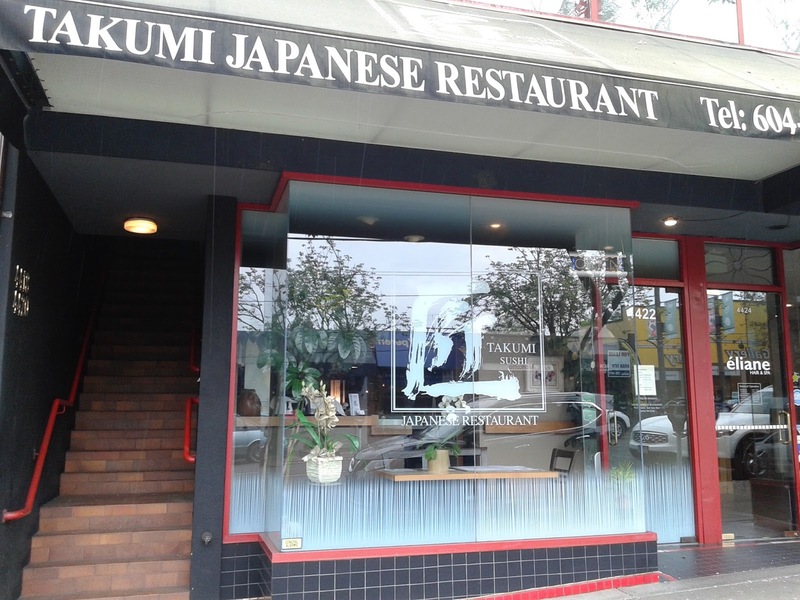 Japanese Bistro Hatzu is a fusion Japanese restaurant that was previously the home of Sushi Bella and is run by the same owners. (Check out The Georgia Straight's article for more details about the launch of Japanese Bistro Hatzu.) 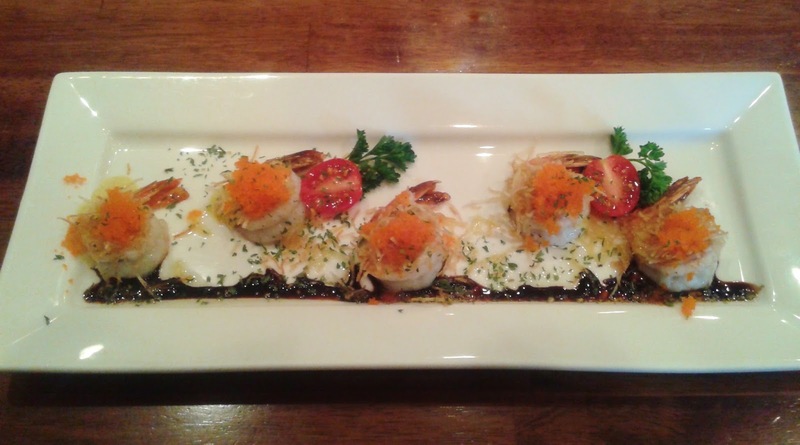 The bistro features a variety of innovative fusion dishes in addition to an upscale dining area. The atmosphere was quite lively, and the restaurant was bringing in a steady stream of customers. I scanned the menu for things that looked like they would replenish my energy, and dancing shrimp seemed like a good option. The shrimp were meaty with a snap, and the truffle oil, balsamic reduction, and basil pesto blended well together. The creamy, savoury flavour of the shrimp was topped with a nice helping of bubbly masago. 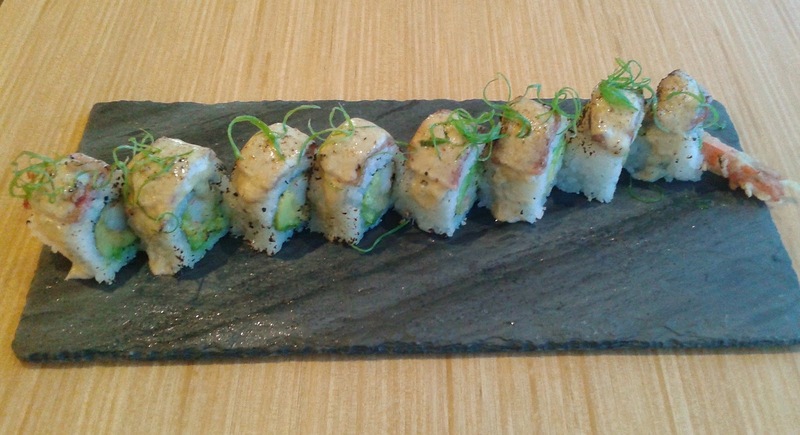 Of course, I went for one of my favourite dishes to order at any fusion Japanese restaurant: the Salmon Oshi Sushi. The salmon had a soft texture, and the rice formation was above average. However, the jalapeño slices were quite large, and combined with the spicy mayonnaise, the oshi sushi was so spicy that I actually started crying. Trust me, that did not look very manly. After downing my entire glass of water, my mouth was still slightly burning. That being said, if you are used to eating spicy foods, then you should be able to manage this dish. While my energy levels were a bit higher, they still weren't at their best, so I thought that if the entire ocean started dancing, that would do the trick. The Dancing Ocean Roll came with prawn tempura, avocado, cucumber, sockeye salmon, tuna tataki, oroshi ponzu (grated radish with citrus sauce), green onion, and sesame seeds. Light seasoning was sprinkled on top of the roll for enhanced flavour, and the black pepper that garnished the tuna tataki was prominent. The thin pieces of sockeye salmon were actually glistening, and the creamy avocado inside was pleasant. The only issue with this roll was that the tempura was a bit overdone, which made it slightly hard and dry. 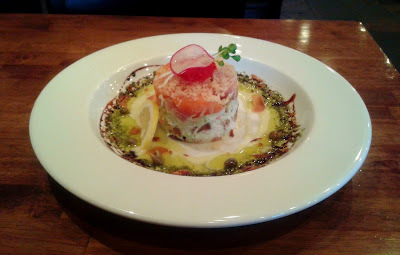 My last dish of the day was the Hatzu Crunch Tower, which featured salmon and tuna sashimi, avocado, tenkasu (fried flour-batter bits), crab meat, shitake mushrooms, lemon mayonnaise, basil pesto, olive oil, garlic chips, capers, balsamic reduction, and tobiko. Yeah, they pretty much put the entire herbs section of the supermarket into this thing. With a predominantly creamy texture and flavour, this tower reminded me of sushi without the rice and the seaweed. The tuna was especially fresh and fresher than the salmon. This is a heavy dish, and although it is not very large, I would recommend sharing this with at least one other friend. The service was professional and on-point throughout my visit. 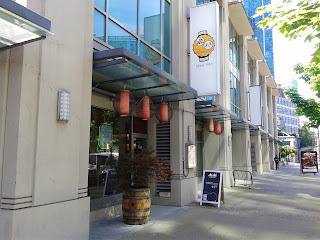 I enjoyed my visit here significantly more than my visit to Sushi Bella in Kitsilano (I'm not sure if the other Sushi Bella locations are better). The food was consistently well-prepared and above average. My energy was fully replenished by the end of the meal, and I would say that it was worth all the hassle I experienced in trying to get here. I often like to actively participate in my classes because it helps me remember the information and keeps me from getting distracted. However, participation does not come easily if you had completed the pre-requisites for a course two years ago and have my memory. Combined with the fact that the lecture was held in the morning, my attempts to participate turned into awkward staring sessions with the prof and an abundance of laughter from my classmates. Well, at least I was entertaining. I contemplated ways to increase my memory and IQ, and of course, the solution was staring at me in the eye: a delicious round of sushi. 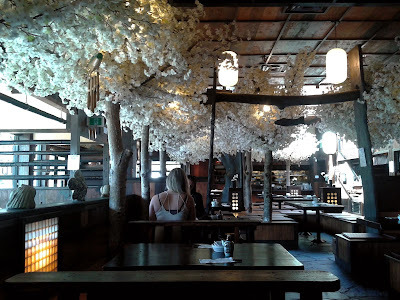 After the lecture, I did my usual and sleep-travelled to Aki Japanese Restaurant, a well-known authentic Japanese restaurant situated right next to Coal Harbour. Aki's current location has a trendy upscale interior, and it was filled with the scent of lemon meringue pie when I walked in (I'm not sure why). The menu focused on traditional Japanese dishes, and the lunch combos were noticeably cheaper than the standard items. In order to get the weirdest look possible from the waitresses, I decided to order two lunch combos. Each of my combos came with a Miso Soup, and fortunately, both were well-prepared. 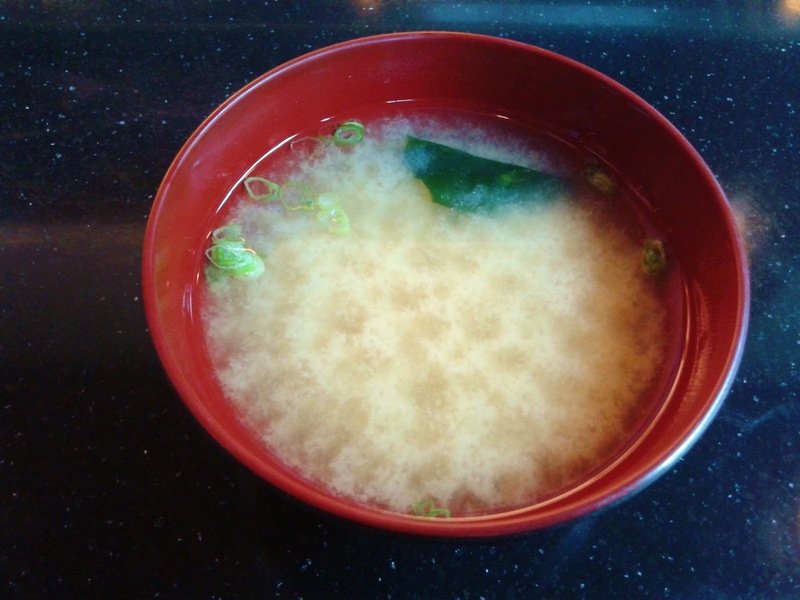 The Miso Soup came with seaweed, green onion, and tofu. It was served at just the right temperature and had a well-balanced flavour. Next to arrive was the Sushi Combo. 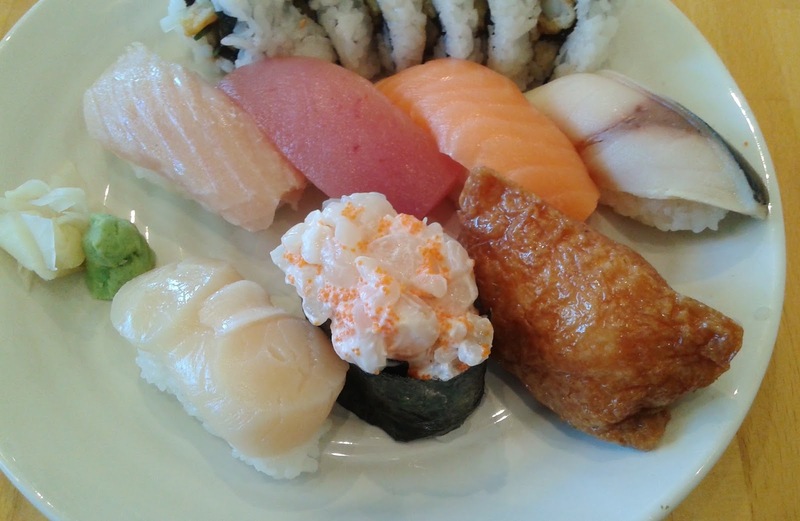 The sashimi was cut into tiny pieces that were each barely the size of a Pink Pearl eraser. 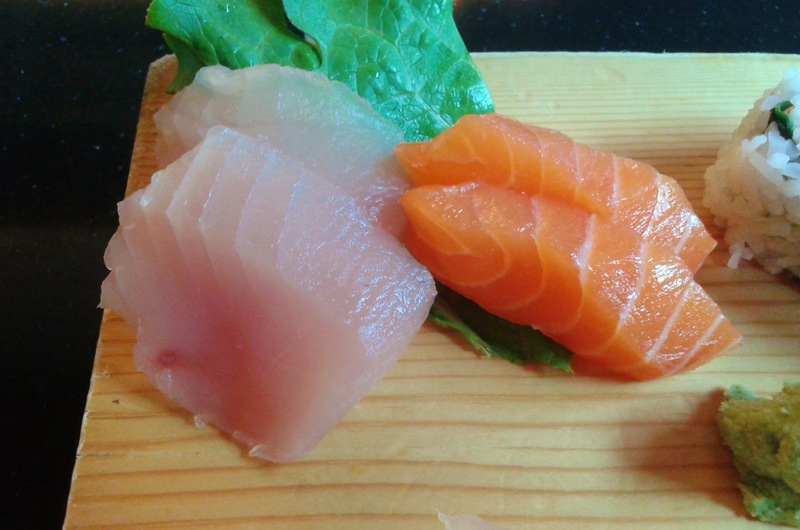 However, both of types of sashimi were very fresh. The salmon had a pleasant buttery flavour, while the tuna had a delectable smooth texture. Next up was the standard maki sushi, a place where miracles rarely occur. The California Roll had a good balance of flavours but was slightly dry. The hosomaki rolls on the right were standard fare too. 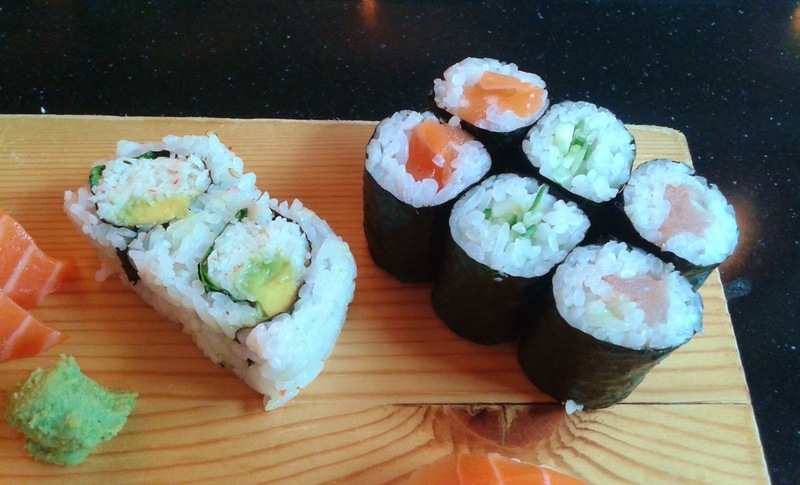 I enjoyed the rich flavour of the seaweed and the decent projection of flavour from the inner ingredients, but there were also issues such as a small bland clump of rice that I found in the Salmon Roll. 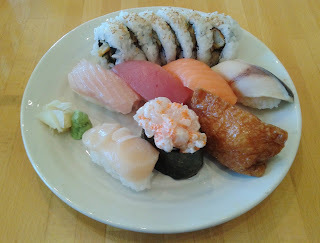 With the nigiri, the sushi rice was a touch dry for my liking, but the toppings exhibited ample freshness. The Ebi Nigiri was sweet and had a nice crunch to it. 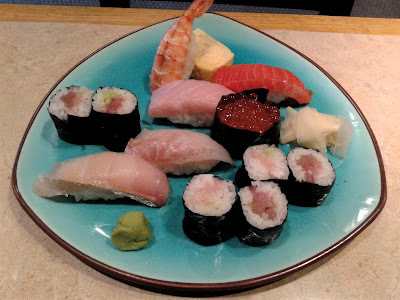 The Tuna Nigiri featured soft, melty tuna, and the Tai Nigiri was also delightfully soft. 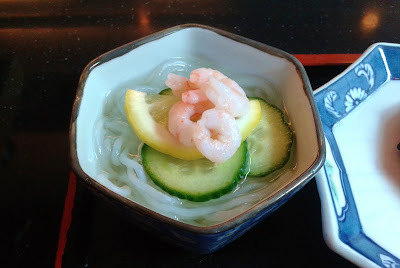 The Ebi Sunomono was especially sweet and came with soft baby shrimp. The sunomono was on the milder side, and it was very light on the vinegar. The "soup" was quite drinkable. I would prefer a little more punch from the vinegar. The Marinated Black Cod was a hit and a featured a delicious grilled flavour. You can take a large chunk and have the juiciness of the cod melt in your mouth. 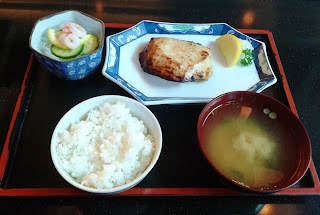 It wasn't the best black cod I've had though, and it would benefit from a slightly stronger miso flavour. Overall, the service was very friendly and professional. This is my second visit to Aki (the first was before I started this blog), and this visit confirmed my initial impression that Aki was consistent but did not provide any surprisingly outstanding dishes. What was surprising though was the fact that I had consumed both combos and taken all my notes and photos in the span of just 25 minutes. That is faster than the time it takes me to figure out how to operate the washing machine. I believe I have finally eaten enough sushi to activate my super saiyan food blogging abilities. After finding my way out of Langara, I walked over to Kyuzo Japanese Restaurant, a new, upscale, Chinese-operated Japanese restaurant. The walk there was longer than I had anticipated, so I entered the restaurant totally exhausted and a little sweaty, which totally made for a brilliant first impression. Another thing that I did not anticipate was the high prices and the high number of fusion items that piqued my interest, so I ended up following my heart's desires, which resulted in a rather nasty bill. That being said, the dining space was elegant and the service was professional. 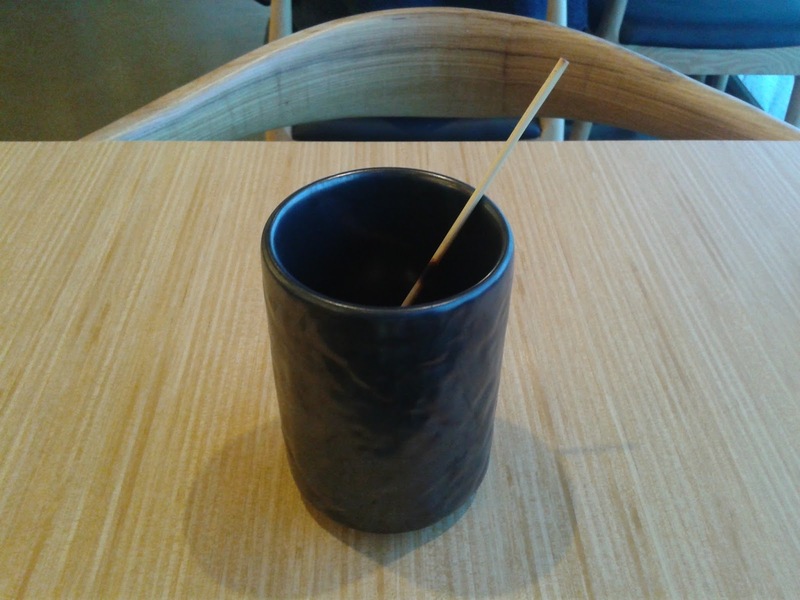 If you order any skewers, you will be presented with the black cup above to hold your empty/finished skewers. Do not pour your tea into this cup like I did! When the waitress saw what I was doing, she frantically rushed over to stop me. Oops... This was mostly my fault for not paying attention to my surroundings. First up was the nigiri, which was not mindblowing but reasonably prepared. 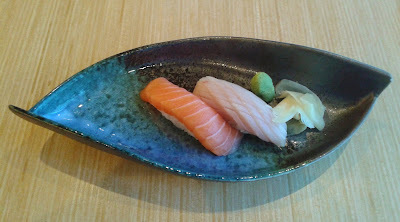 The salmon came with a thick, neat cut and a nice buttery flavour, but it was slightly dry. The toro also came in a generous cut and was soft, though not exactly melty. The sushi rice was decent. 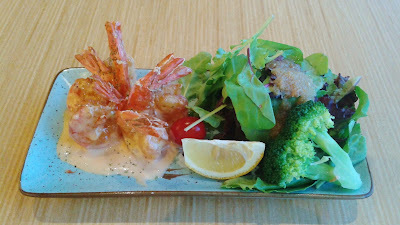 Next, the Ebi Mayo came with spicy mayonnaise and tough, overdone shrimp. There was very little crispiness, but I felt like I was eating the shrimps with the shells left on. The flavours worked, but the textures did not. Now, let's take a look at the salad to the right. Why is there a big, honking piece of random broccoli in there?? Did they run out of green salad? I think they took the term "liberty" a little too far. 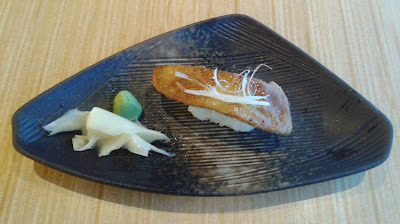 Whatever happened with the previous dish, they made up for it with this $6 piece of Foie Gras Nigiri. The foie gras was very juicy with lightly crispy edges and was dressed with a light coating of truffle oil. This was not just delectable, but it also worked as a mood booster and an embarrassment forgetter for me. 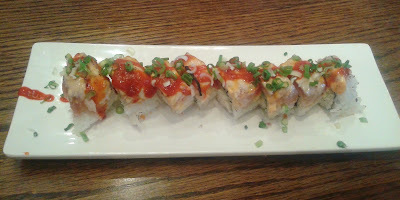 The Salmon Oshi was a decent attempt at mimicking Miku's famous Salmon Oshi Sushi. This won't be mistaken for Miku's version, but the creamy sauce on top was savoury, and the jalapeño provided just the right amount of spiciness. They also added salmon inside for enhanced flavour, though the rice around it was a little too tightly packed. 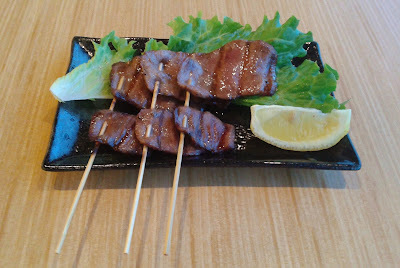 The Gyutan Kushiyaki (grilled beef tongue skewers) came with a good amount of seasoning and a nice helping of black pepper. 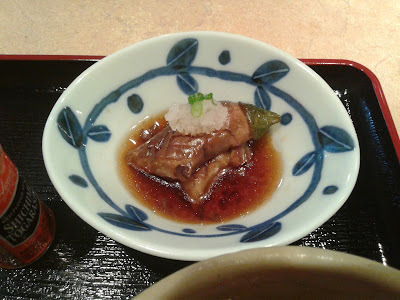 There was sufficient moisture in the beef tongue, but it was slightly tougher than Zakkushi's version. The Parmesan Beef Roll came with prawn tempura, beef carpaccio, truffle oil, and parmesan cheese. The tender, thin slices of beef on top were very savoury when combined with the truffle oil and cheese, and as a whole, the roll felt a little too heavy. Inside the roll, the sweet, creamy avocado worked well with the meaty prawn. I am one of those people who like to eat a lot, not exercise, and stay slim. Being a person who gets sick quite often, I would accomplish this by going on an extreme diet during my sick days. Usually, I get sick for around 20 days every flu season, and my brilliant strategy would work like a charm. However, this flu season, I was sick for only two days, so I was packing on extra kilograms faster than the pregnant fish in Insaniquarium. I first thought of burning off some calories by walking the entire perimeter of Stanley Park, but having not exercised in months, who was I kidding? I opted for the much shorter Steveston boardwalk instead. 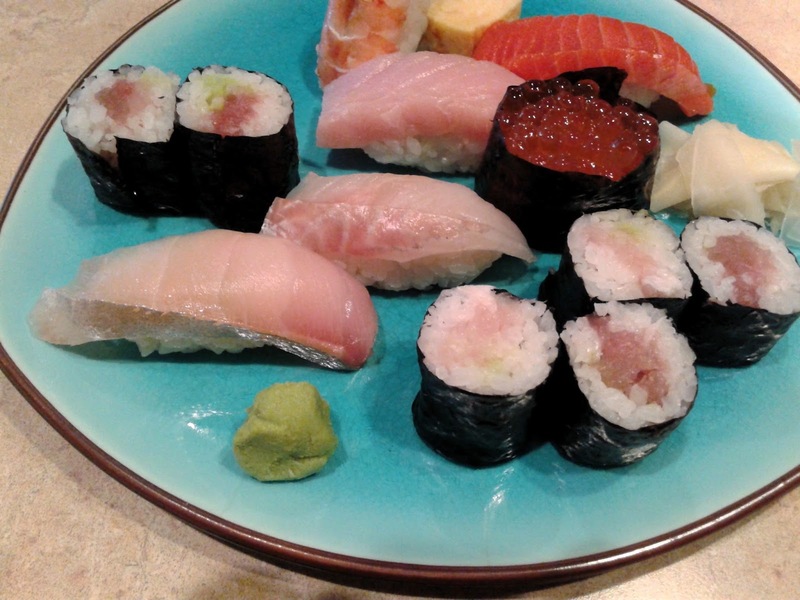 Of course, I had to have some sushi first, because what is the point of exercising if there is no sushi involved? 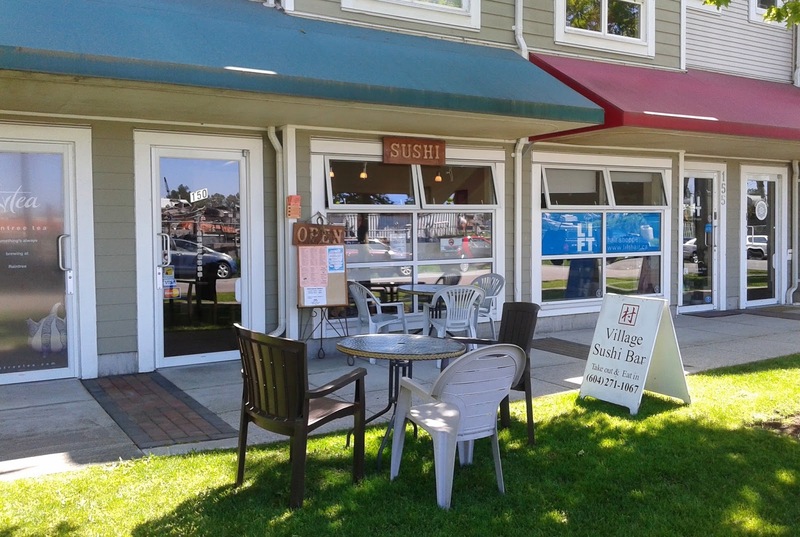 Near the east end of the boardwalk is Village Sushi Bar, a small, quaint, authentic Japanese restaurant. It has some of the highest ratings of any sushi restaurant in Richmond, which provided me with another reason to give it a try. The restaurant has a pleasant smell as you walk in, and the waitress was very welcoming. The menu is limited to the more basic items, and I don't recall seeing any item above $10. My savings account let out a huge sigh of relief. The Tuna Tataki Salad came with three pieces of lightly seared fresh tuna. 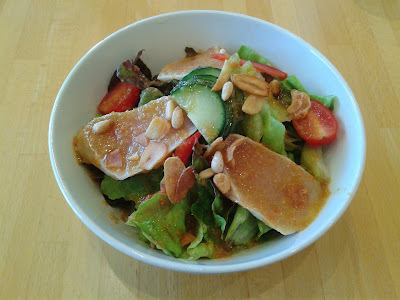 I would have liked a little more of a smoky flavour with the tuna, but the garlic chips and pine nuts in the salad did accentuate the flavours of the salad. Furthermore, the dressing was sufficient and spread evenly, creating a refreshing, well-rounded salad. Next came all of my sushi on a large plate. I think I ordered more than half of all the different kinds of nigiri they had. Normally, I get Dragon Rolls for something between $10 and $15, so when I saw this Dragon Roll for just $5, how could I resist? Unfortunately, the lower prices came with lower quality. My soul died a little at the tightly packed and inadequately seasoned sushi rice. The roll was also rice-heavy, so the flavour of the unagi got lost in the mix. On the plus side, the tempura prawn inside was well-prepared and had a nice snap. 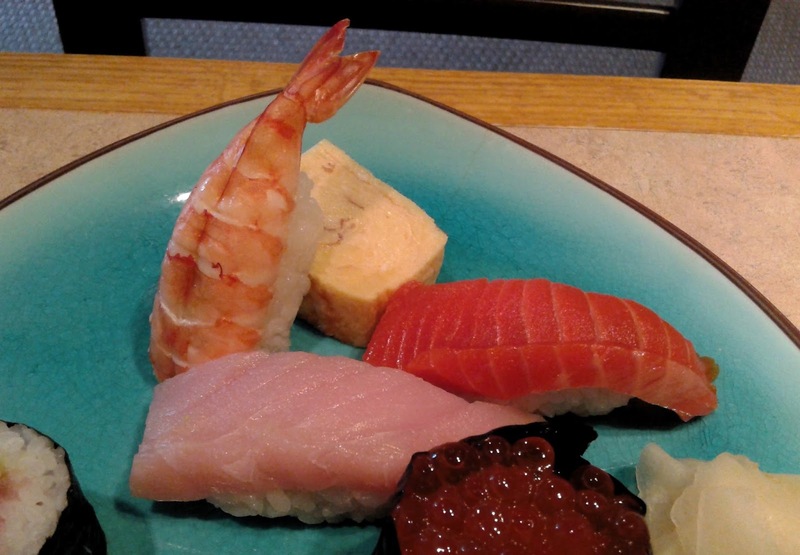 With the nigiri, the fish was very fresh and delicious in general. 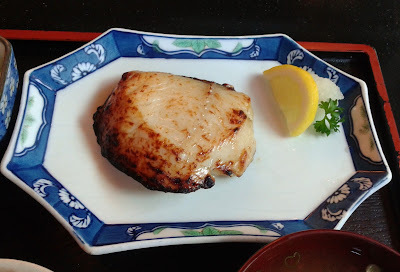 The hotate (scallop), salmon, and tuna all had delectable, soft textures, and the toro was quite juicy. My least favourite was the Saba Nigiri, which was a little too salty. Unfortunately, the sushi rice was packed much too tightly and interfered with my enjoyment of the softer textures of the fish. If it weren't for this, I would have given out a lot of A's here. 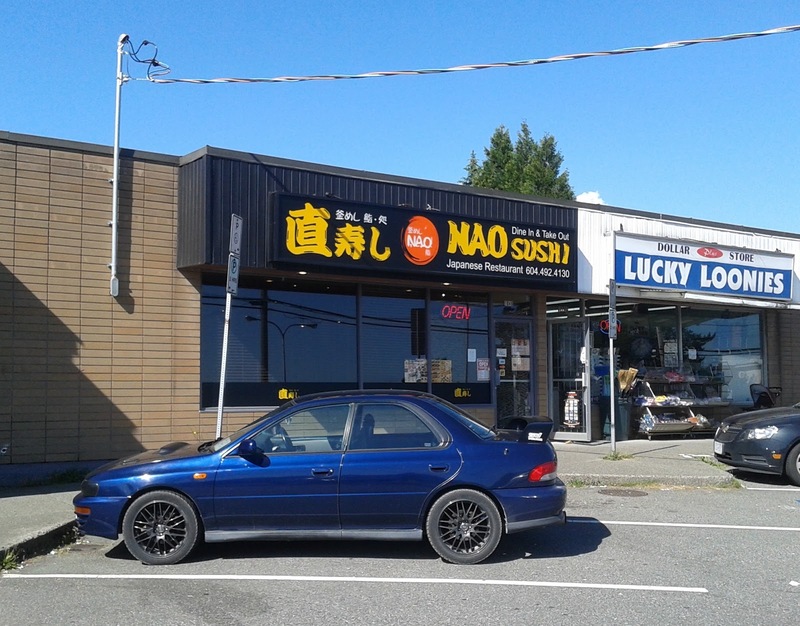 With significant wait times during peak lunch and peak dinner hours, Nao Sushi started out as one popular restaurant in South Burnaby with too many customers. 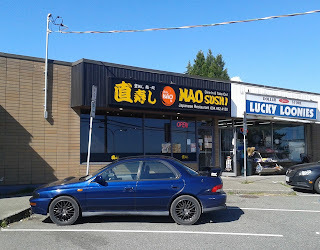 Now, with a new location in Coquitlam, Nao Sushi has become two popular restaurants with too many customers. The first time I tried to dine at Nao Sushi with my family, the line-up was so long that I led my family to Jimoco Cafe & Pasta instead, which is a miracle because (a) Jimoco Cafe is rather famous for its lengthy wait times and (b) I actually made a conscious decision to give up sushi for something else. I must have been a little high that day. Needless to say, the four of us came back to try Nao Sushi the next weekend. Luckily, we got a seat one minute before a line-up started to form. Seriously, I had never known that there were this many sushi lovers in this part of town. There were about five chefs and three waitresses working non-stop to meet the diners' demands, and even then, the food came out very slowly. For 20 minutes, we had the pleasure of watching everyone around us get their food while our hunger raged on. This felt exactly the same as seeing all my friends graduate and land amazing careers while being stuck at SFU myself trying to decipher the mystic "foreign language" in my textbooks and growing a dozen new zits in the process. First to arrive was the Aburi Toro Nigiri for my sister and me. Both of us were not especially pleased with the Aburi toro because it lacked a seared flavour and was drier than usual. However, the sushi rice was well-constructed and above average. The portion size was quite generous too. My mom ordered the Atlantic Roll, and it was a great success. My mom has this uncanny luck when it comes to ordering, and she manages to order the good stuff even when she has no clue about what the menu actually says. 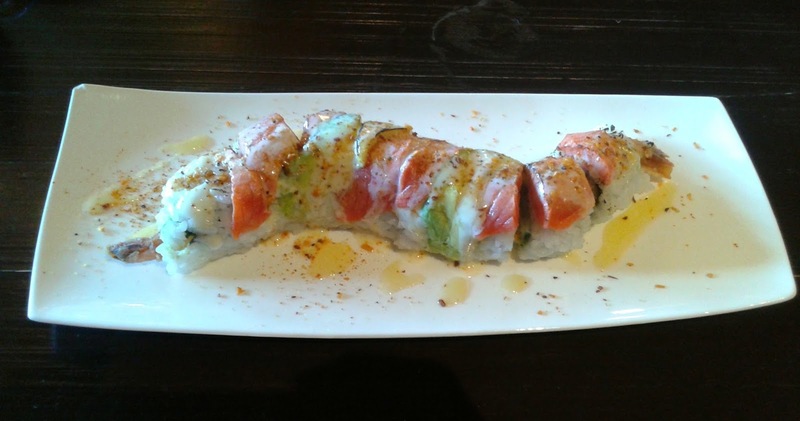 The Atlantic Roll consisted of Atlantic salmon, masago, and avocado, and it was covered in a thin layer of Japanese salad dressing for some creaminess. The creamy flavours of the salmon and the avocado, along with the bubbly masago, provided an excellent harmony of flavours. Next, we had the Assorted Sashimi, which came with one piece of amaebi, three pieces of tuna, three pieces of salmon, one piece of tsubagai (whelk), two pieces of madai (sea bream), three pieces of hokkigai, and two pieces of tako. The sashimi was generally very fresh, with the amaebi and the very juicy tako being the highlights. The only real fault was the excessively cold temperature of the Tuna Sashimi, which made it come dangerously close to turning into a tuna popsicle. The Aburi Spicy Tuna Roll consisted of a California roll, seared tuna, and spicy tuna. It was moderately spicy with a good amount of chili sauce on top. The crab meat was rather soft, but the tuna can be a little softer. I couldn't really taste any Aburi flavour under all the spiciness and didn't see the point of searing the tuna, but I suppose putting "Aburi" in the name would get more people to try the roll. 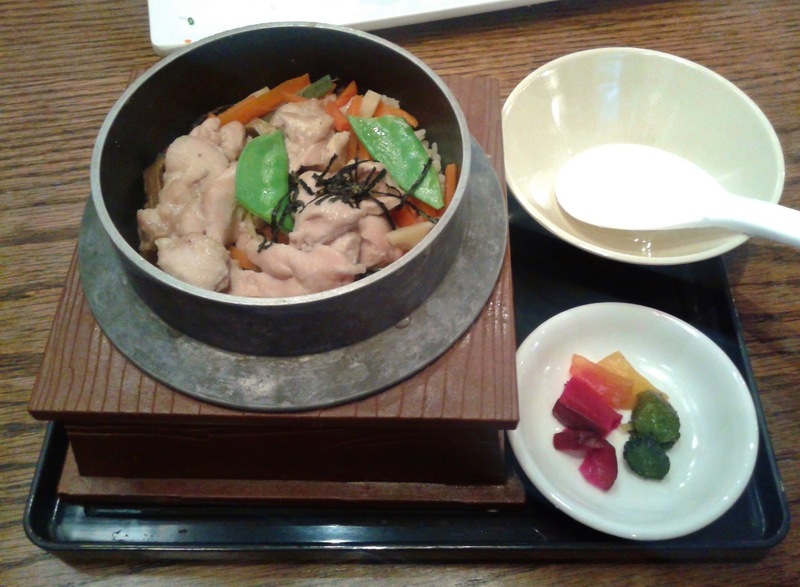 The Chicken Kamameshi was a steamed rice hot pot with chicken and vegetables. The rice had lots of moisture and absorbed the flavour of the bamboo shoots well. The steamed chicken was very tender. However, this tasted a little too much like comfort food to me. Even my dad, who ordered this dish, said it tasted too healthy for him. I don't think I've ever heard my dad say that before. 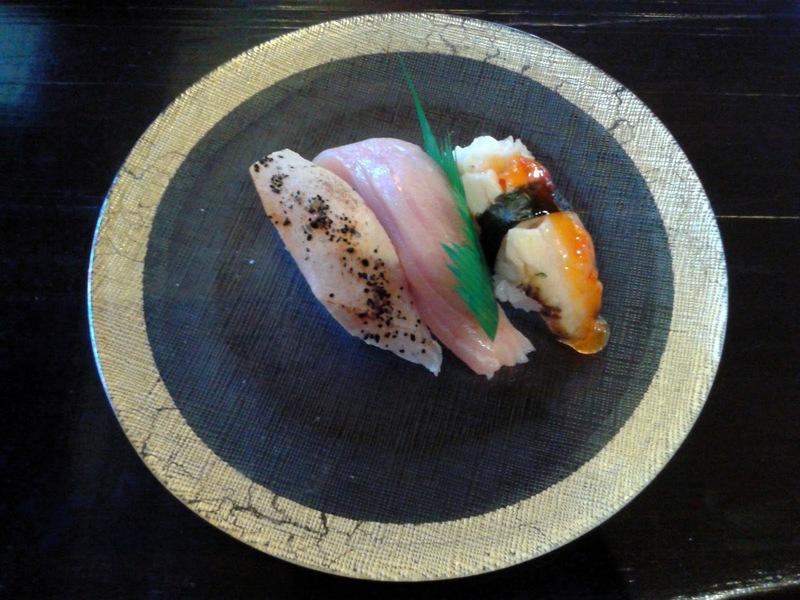 Our final item was the Kawari Battera, which featured anago (sea eel) on one side and ebi on the other. The anago was cut thinly and didn't have much impact, but they were clever enough to use avocado to help enhance the flavours here. 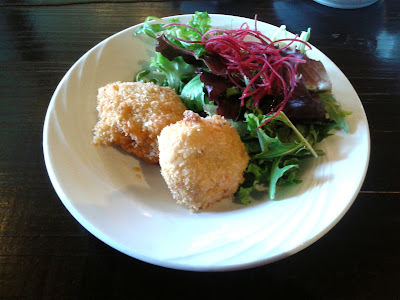 On the other hand, the ebi had an appealing chewiness and contained a surprising burst of richness. The rice was again well-made, just like in the nigiri sushi earlier. 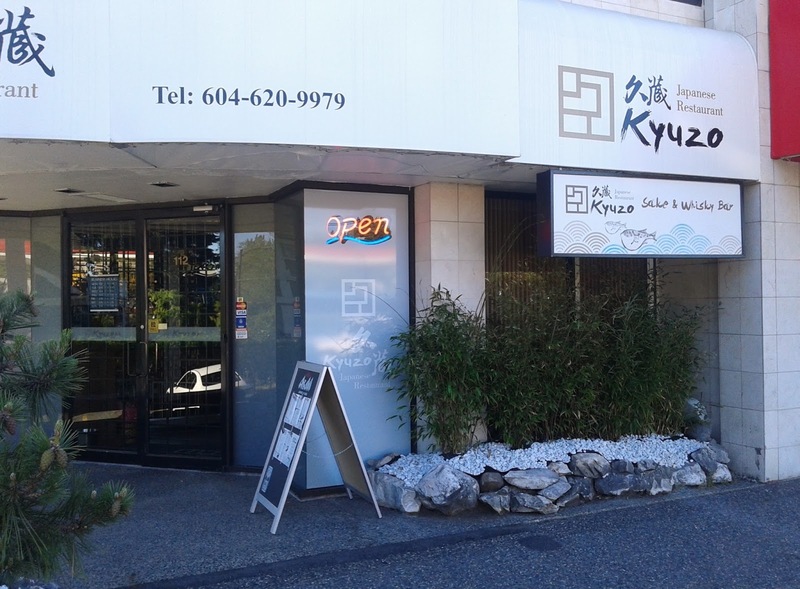 Overall, the service was friendly, and the food was well-prepared, perhaps even more so than at the South Burnaby location. 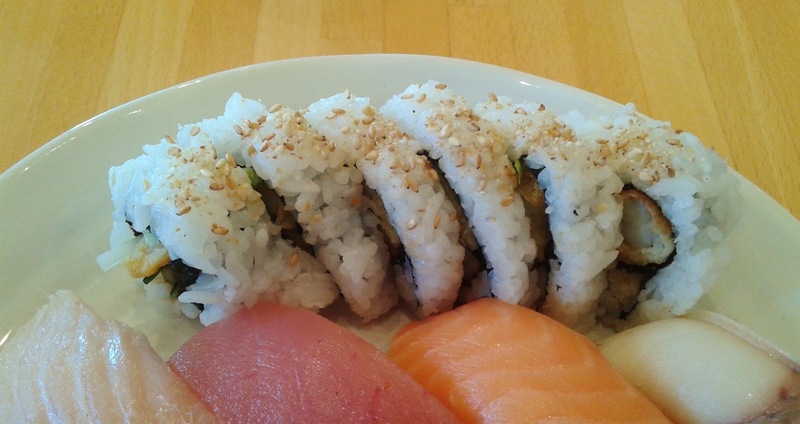 The sushi rice is clearly one of Nao Sushi's strengths. After we finished all the food above, I was still hardly full (as expected). Not wanting to wait a long time again for my food to come out, I went to stuff myself at Starbucks, where I could indulge in bank-breaking beverages and experience the joy of having my name spelled wrong. Semester breaks always give me an excellent opportunity to relax, refresh my brain, and become nocturnal. As soon as midnight strikes, my refrigerator and my cabinet of snacks suddenly turn into huge Raymond magnets, and moments later, I'm sitting at the dining table with a pile of cookies, chocolates, jello, ice cream bars, etc. in front of me. After a nice calorie overdose, my energy level goes off the charts until I feel hungry again, and the cycle continues until sunrise. Besides the sun, there is only one other force powerful enough to stop this vicious cycle: the thought of going on a sushi adventure the next morning. Miraculously, by harnessing the power of sushi, I managed to get myself up at 8 in the morning. With plenty of time to spare, I ventured all the way to South Surrey to have lunch at the newest Sushi Mori location. I found it ironic that there was a sign outside the restaurant that said "Taste the true Japan," given that the restaurant is in fact Korean-operated. Furthermore, the extensive menu contains a lot of fusion dishes and even some Korean dishes. The typical menu items were priced regularly, while special or innovative dishes came at a significant premium in general. The Sushi Mori chain is also quite well-known for its highly elaborate dining areas. As you can see, my seat featured a marvelous view of a wooden fish-shaped object dangling from a raised log. Next up was the Salmon Ceviche Goma-ae. 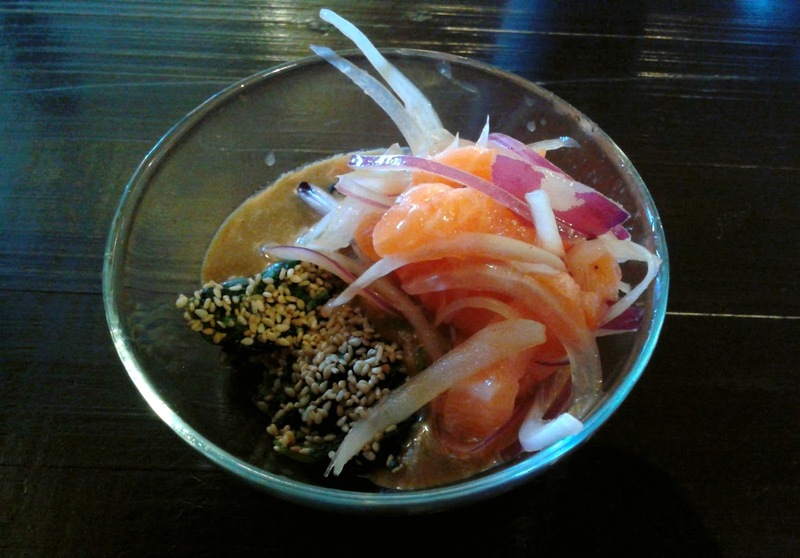 The salmon sashimi had a soft, smooth texture and was dressed with a citrusy salad dressing. The spinach was also decent but covered with perhaps too many sesame seeds. Sitting at the bottom was a large dose of overly thick sesame sauce, which didn't exactly mix well with the tangy salad dressing. 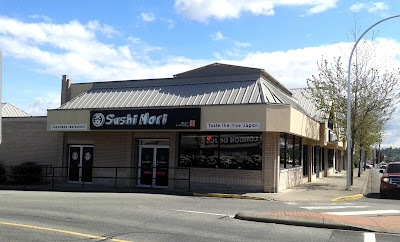 A few years ago, I visited the Sushi Mori in Langley and was not very impressed with their Aburi (seared) sushi. Unfortunately, the Aburi sushi here does not seem to be any better. The Aburi Tuna Nigiri was dressed with salt and pepper, which completely eliminated the seared flavour (if there was any to begin with). There was also too much salt on the tuna. However, I'll give them credit for the above-average rice formation. 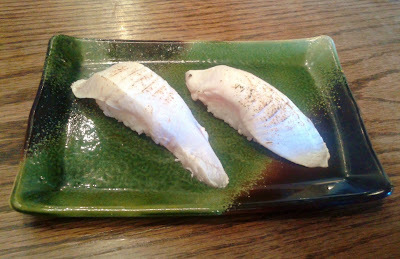 The Toro Nigiri was excellent and came with a mouthwatering melty texture. The Sous Vide Lobster Nigiri had a nice chew to it and was dressed with sweet chili sauce, which provided a refreshing zing. The Crab & Oyster Crab Cake consisted of two plump croquettes with real crab meat, onion, bell pepper, and oyster as filling (in addition to a salad). The crab cakes came with two dipping sauces (sweet chili and orange), which I did not photograph because I did not realize their importance until biting into the crunchy but weakly flavoured batter. Both dipping sauces were good companions for the croquettes. A delicious seafood flavour emanated from the crab meat and oyster inside. 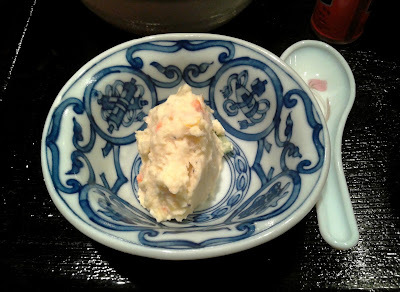 The crab meat and oyster were very finely cut, making the filling extremely soft (it borders on being mushy). I don't know about tasting the true Japan here, but at least I could taste the true Korea with the Bulgogi Rice Bowl. 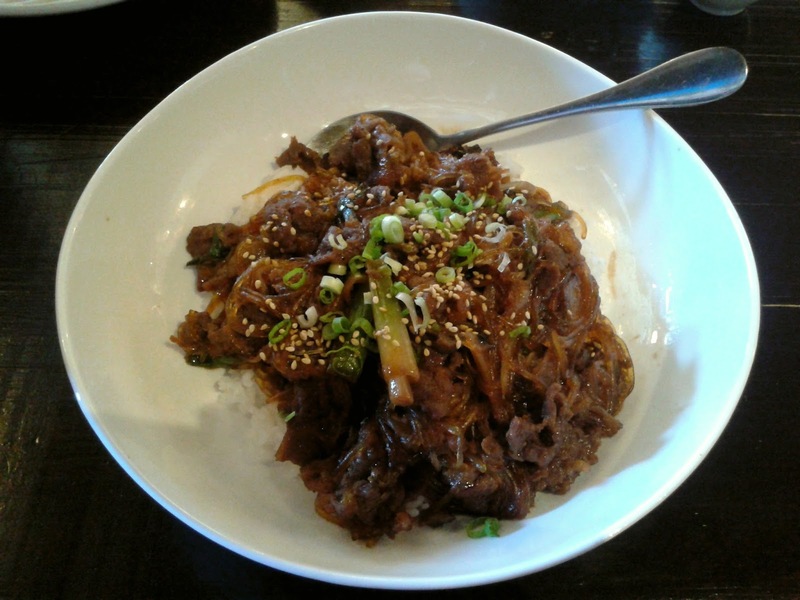 This rice bowl featured Korean-marinated AAA beef with rice and Japchae noodles (sweet potato noodles). The beef was tender and high-quality, but for some reason, some of it was bunched up together into chunks. The Japchae noodles were on the softer side and absorbed the flavour of the bulgogi sauce well. Overall, this dish was good enough to stand up to the bulgogi beef at an average Korean restaurant in Vancouver. I received friendly service during my visit, and I was a little surprised to see that the large dining space did in fact become substantially filled up during the peak lunch hours on a weekday. After tips, my lunch did traverse the $50 mark, but other than the weak Aburi sushi, the food was generally prepared with care. I also ended up so full that I had to walk over to Walmart and browse through the skinny Barbie dolls to convince myself to be a little more conservative with the ordering next time. ...on a Friday morning, and this time, the door finally gave way to my majestic presence. Inside the restaurant was a semi-fancy atmosphere coupled with some elegant jazz music in the background. One quick sift of the menu was all it took for me to notice that the sashimi and nigiri were very pricey. I'm sure we are all familiar with the love-hate relationship between me and my wallet, but this time, I decided to go easy by ordering combos rather than separate pieces of nigiri. 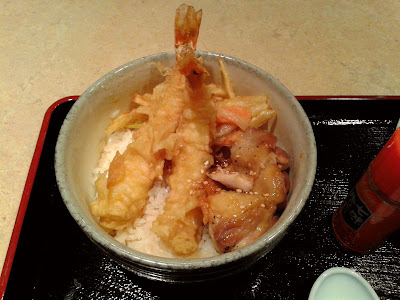 First up was the four-course Tempura & Chicken Teriyaki Don Lunch Set. 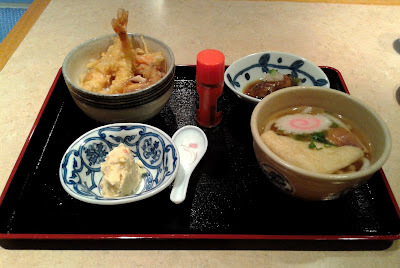 The Chicken and Tempura Don came with tender, juicy chicken as well as two plump tempura prawns with a good snap. The batter had a distinct sweet flavour, but unfortunately, it lacked crispiness and was rather soggy. The rice would also benefit from a bit more sauce, though this issue was somewhat relieved by the savoury tempura sliced onions. They did not give me a name for this dish, so I decided to call it Eggplant Enjoying a Tranquil Bath. This dish consisted of two pieces of juicy, mostly soft eggplant bathing in a light soy and mirin mix akin to agedashi tofu sauce. It was served cool and garnished with grated daikon and green onion. The Mashed Potato Appetizer was served chilled and generally had a soft, melty texture. Some of the vegetables mixed inside were a little chewier than expected. 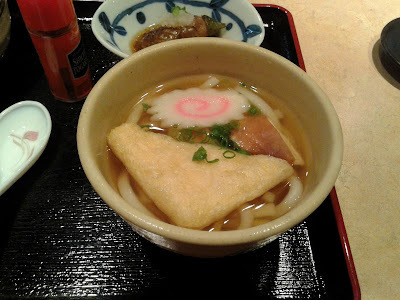 The Udon was a soothing finish to the lunch set, though there was hardly anything special about it. The lightly fried bean curd ended up being rather chewy, and the noodles were a bit too soft for my liking. However, the broth had sufficient depth of flavour. After the lunch set, I got the Assorted Sushi à la Carte (don't ask me why the sushi combos were labelled "à la carte"—I have no clue). At $25, this was more than twice the price of the lunch set. Those nigiri better have a beautifying effect on my face! The Assorted Sushi à la Carte got off to a solid start. The Tamago was sweet and cake-like with a soft, fluffy texture. The Ebi Nigiri had a nice snap and a pleasant sweet flavour, though it was a touch dry. Next, the Sockeye Salmon Nigiri was fresh and came in a thick cut, but still remained soft. The Albacore Tuna Nigiri melted perfectly in my mouth with a savoury, rich flavour, and I could totally feel my face becoming more and more beautiful as I ate it. Okay, fine, maybe not... The sushi rice here was very good, though it was not quite at the level of Miku and Octopus' Garden. Both the Hamachi Nigiri and the Madai Nigiri came with a delectable smooth texture and a delicate flavour. The Ikura Nigiri was juicy and rich and came with lots of fish oil. I also liked how it was bite-sized. The Tuna Roll came in large pieces and contained the same heavenly, melty tuna as the Albacore Tuna Nigiri, but the roll ended up being quite rice-heavy (this is evident from the photo). The service was friendly and professional, as expected from a restaurant that claims to be in the "Fine Dining" category. I also very much enjoyed the food here, which was carefully prepared and consistently well-executed. However, there is also a slight premium for the semi-fancy atmosphere and the location. 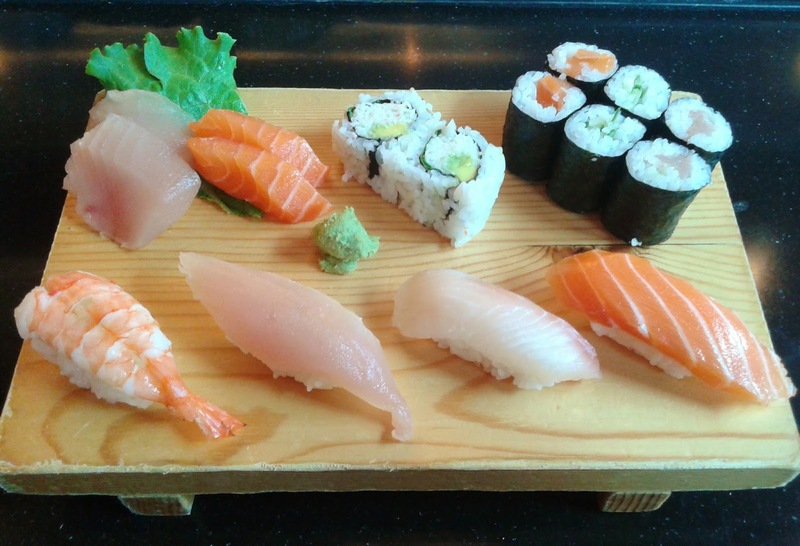 If you are not really looking for ambiance, you can also try Kaide Sushi Bar, which offers nigiri at a similar quality level for a lower price.